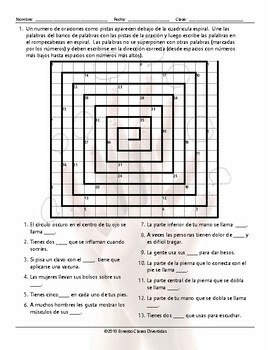 This is a 2-page word spiral worksheet. Each worksheet has a total of 35 words, a puzzle grid, sentence clues with the missing words and a word bank at the bottom of page of the second page. Students will look at the word bank and use the words to fill in the missing words in the sentence clues. The missing words becomes the target words to be found on the grid. The words do not overlap with other words (marked by the numbers) and they must be written in the correct direction (from lower numbered spaces to a higher numbered spaces).